Allred Dental puts quality and excellent customer service ahead of everything. We know how important quality dentistry is and we have strived since the beginning to offer the very best in San Marcos dental services. This is why we decided it was best to open our own state-of-the-art facility focused on implant dentistry, where we can provide our patients with everything starting from measurements to manufacturing dental implants to fit every need. Dr. Allred has had the great pleasure of changing lives through implant dentistry and has studied extensively, giving the highest level of satisfaction to his patients. The San Marcos-based facility has the newest equipment on the market, specifically made for manufacturing flawless dental implants. Techniques are also important, so Dr. Jeff Allred is constantly looking to learn and improve his skills and knowledge related to implant dentistry. WHY DO PEOPLE IN SAN MARCOS CHOOSE US? Last but not least, we welcome our patients from San Marcos and the surrounding areas to the office as if they were family because we understand how important communication is during a visit to the dentist. We are looking to offer a calming experience for our patients and provide them with the best dental service in San Marcos. If you are still not convinced, pay us a visit today and we will show you around! Missing teeth are common. Whether the culprit is tooth decay, an unexpected accident, or a root canal, tooth loss can happen at any time and at any age. With dental implants at Allred Dental, missing teeth can be replaced safely and efficiently with natural and long-lasting results. A dental implant is a small titanium screw surgically placed into the jawline. This titanium screw completely fuses with the jaw bone to create a strong base for a custom crown to replace the missing tooth or teeth. Dental implants will enhance the appearance of your smile as well as maintain the structural integrity of your entire mouth. At Allred Dental, we believe there are significant advantages to choosing dental implants over traditional dentures or bridges. Dental Implants will improve the appearance of your smile and restore the structural integrity to your teeth, gums and entire mouth. Dental implants will restore full functionality; eating, smiling and talking will feel comfortable and completely natural again, with no need to change current hygiene habits! Of course, it is always important to brush, floss and use mouthwash as a regular hygienic practice. While traditional fillings last 5 to 15 years and traditional crowns can last 10 to 30 years, a dental implant will last on average 30 to 35 years--sometimes longer! Dental implants are fully customized to fit your mouth and can be used as the base structure to create bridges, partial dentures or replace single teeth. After the implant(s) have been placed and healed, there are no dietary restrictions and patients can eat whatever they’d like with no risk of damaging the implants or teeth. At Allred Dental we use state-of-the-art technology in our dental implant procedure, offering long lasting results in fewer visits to our office. When you visit our office to discuss your treatment plan, you and Dr. Allred will work together to make a decision about which type of dental implant will work best for your specific needs. Even if you need more than one implant installed in an appointment, we are able to accommodate the most complicated of cases. The process begins with placing the implant hardware. A small incision is made in the gum and the implant is screwed into the jawbone. At the end of your first appointment, your implant will be secured and sealed. After the initial placement of the implant, the area will need a few months to heal. During this time the jawbone will fuse with the implant, forming a strong bond. After the healing process is over, an abutment will be placed on the implant, as a base for the new tooth. An impression of the abutment will be taken as a guide to creating a custom permanent tooth. This custom tooth will be fabricated by us, for you, in our unique onsite dental laboratory. This unique replacement is fully customized to naturally and comfortably fit your mouth. By the end of the process your restored smile will look and feel just like it used to, if not better and stronger, you’ll have no excuse not to smile! Most dentists have to send dental implant parts to an outside laboratory to be customized for patients. This means a lot of waiting for the parts to be sent back and forth. 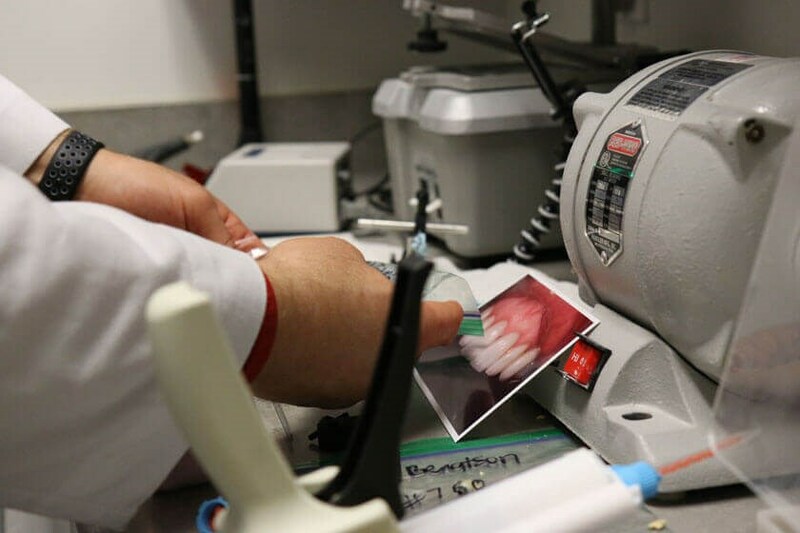 At Allred Dental, we offer a unique dental implant experience by providing a convenient, in-house dental lab. 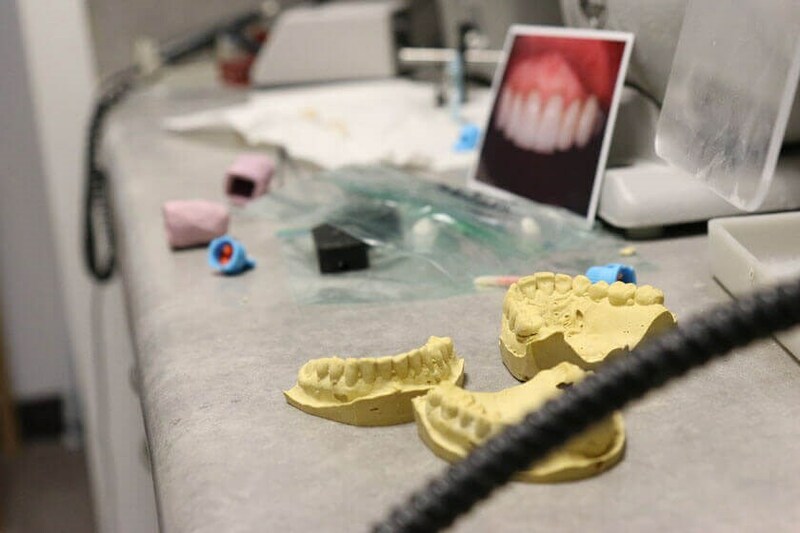 The distinct advantage of our dental lab is that we create the perfect implants, crowns, and dentures--all the hardware we’ll need to fully customize your dental implants--without all the waiting! Furthermore, the team at Allred Dental strives to offer the best dental services possible; flawless dental work, a friendly environment, and top amenities, all with your comfort in mind. If you’re curious about whether or not dental implants could be the solution to replacing your missing teeth, don’t hesitate to contact our office. We look forward to seeing you for your next appointment and providing you a tailored dental experience with your needs in mind.